Posted on January 12, 2011 by Jill B. 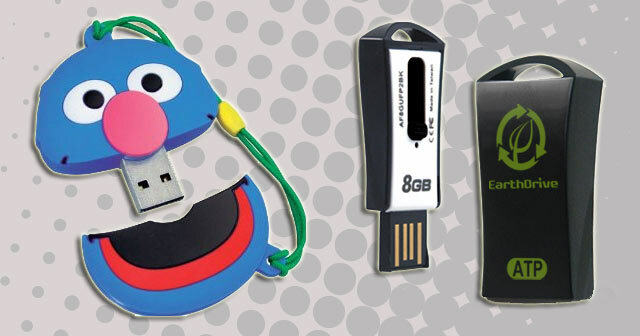 Back in October, AllUSB showed you specs on some adorable Sesame Street flash drives packed with themed digital content (including show episodes) for your kids to enjoy. We caught up with the thumb drive’s maker, ATP, at CES 2011 to see what they were up to as well as to see the drives up close and personal. As expected, the drives are sweet, colorful and are exact replicas of the characters. We were surprised at how great they looked as a children’s accessory, be it a bracelet or necklace. ATP spokesman Michael Plaskin not only talked Sesame Street, but also revealed some details about an equally friendly product that instead aims to be kind to the environment. Hear what Plaskin had to say about ATP’s recyclable EarthDrive and how it’s basically made from something you can find in your grocery store’s produce section. This entry was posted in CES 2011, Custom Shaped USBs, Custom USB Flash Drives, Flash Drive, Movies on USB Flash Drive, USB Bracelets, USB Flash Drives, USB Future, USB Technology and tagged ATP recyclable EarthDrive, ATP Sesame Street Video USB, Sesame Street Earth Flash Drives, Sesame Street Earth-Friendly Flash Drives, Sesame Street flash drives, Sesame Street USB Flash Drives, Sesame Street Video USB Drives. Bookmark the permalink.